Product Description: Single sided full color prints on gloss cover weight stock for use in plexi and acrylic holders. Our cover weight inserts stay put better and are easier to handle and insert than oridanry "text weight" inserts. 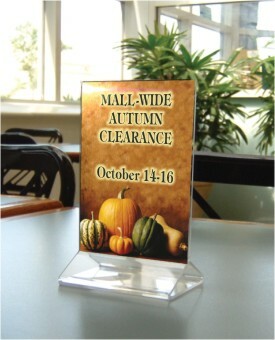 Great for use as table tents, POP signs, and merchanidsing signs. SETUP FEE: A $0.00 setup fee applies to orders of -1 items or less of a given design and layout. The setup fee is waived for this design if it isn't customized (your logo is always included at no additional cost). Setup fees are automatically added to your shopping cart.